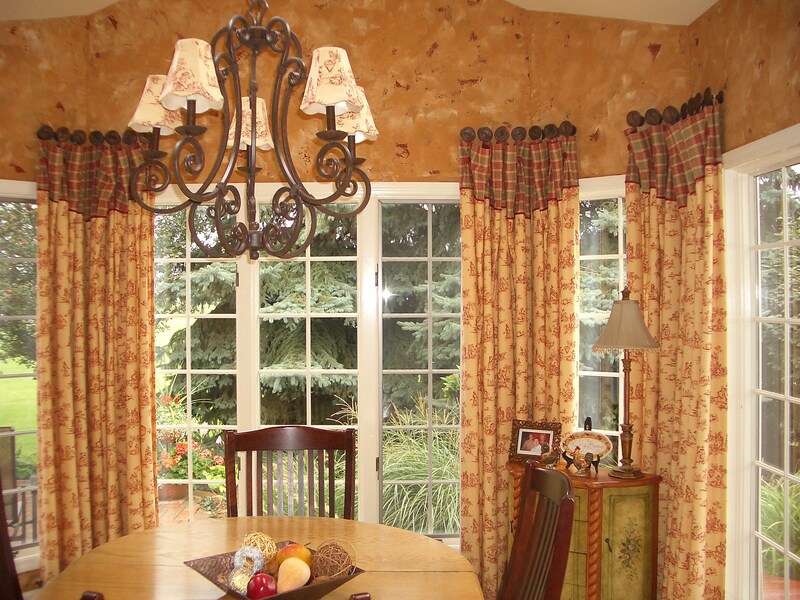 Creating unique custom draperies for your home! 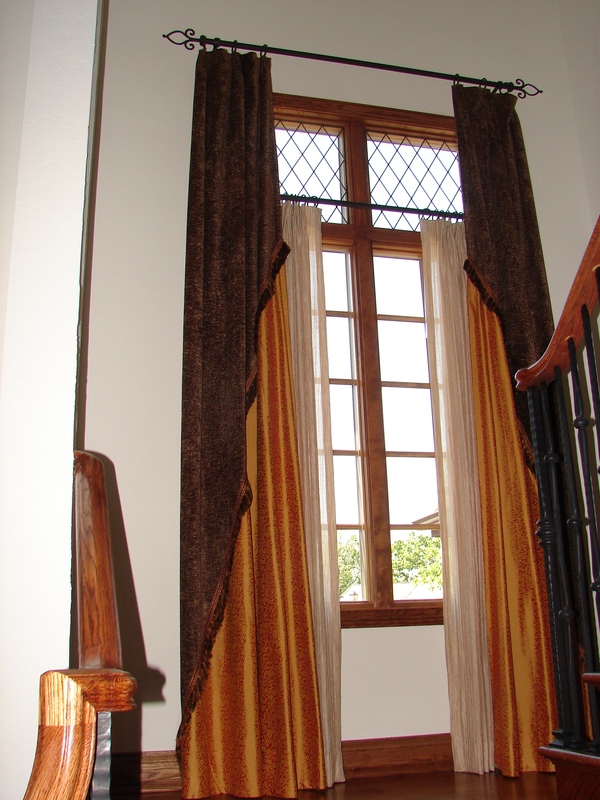 A variety of fabrics, trims and sheers can be combined to create a full range of unique, one-of-a-kind looks for your windows. You may be looking for something functional, like something that will help you with light control, privacy or energy savings. Or you might be looking for the possibility to add that warm touch to your rooms, we are the one stop shop for your window fashion needs. Gailani Designs, have trained and certified staff, to help you with all your window covering needs. We will come out, measure, design, and provide you with an estimate, all in the first visit! 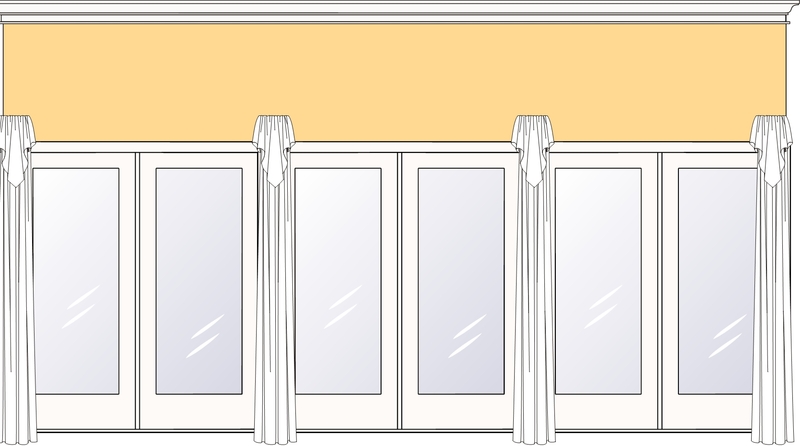 Valances, draperies, sheers, shutters, motorized treatments,blinds, shades,bedding, pillows and accessories, all can be ordered customized to your style and budget! For more information call (630) 420-0800. How much light do you like to have in your rooms? 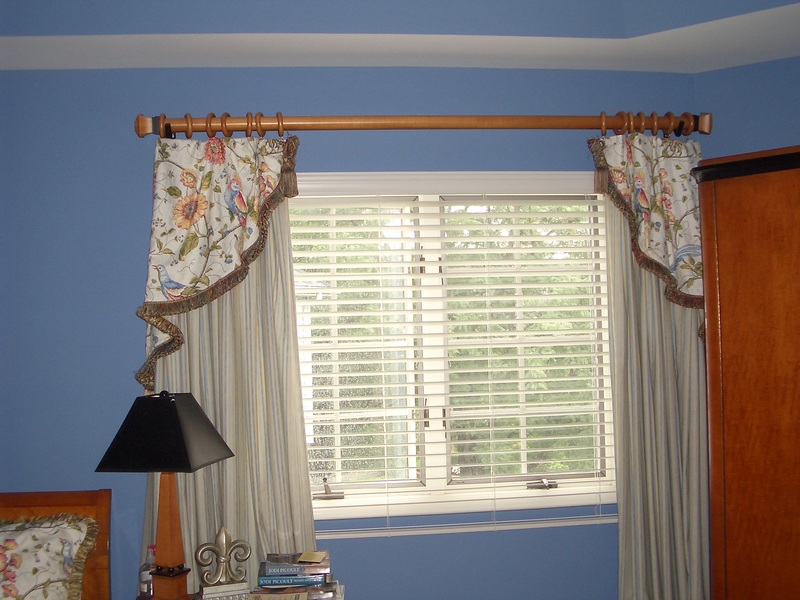 Your window treatments can be designed in order to allow more light in your room or not! Take a look at picture below, this great room has multiple windows, and the client loves the light in her home. Her requirement was to keep the windows as clear as possible, and have minimal coverage yet add the warmth and richness of fabric treatment. The cornices were installed to allow maximum exposure of the window, slender side panels with banners on top for adding decorative elements and tie the room together, finally the sheers can be drawn to the sides to provide total exposure! Call us for free estimates (630) 420-0800. Creating tranquility and comfort in a hotel room! Recently I had the chance to stay at freshly remodeled Hampton motel in Seattle, Washington. The new design was very well put together and that really effected how I felt during my stay. There was an effort to create that feel of home, relaxing, restful environment. The most comfortable bed dressed in all white soft linen, made me want to dive right into it!!! The duvet was so downy and soft, bunch of feathery, slouchy pillows, which made me want to stay in bed for that unsurpassed pampering! Of course I paid close attention to the window treatment. The first layer was a screen shade which totally loved because it defused the bright light and gave the room some privacy and one still could see out. The second layer was draperies with black out lining for total room darkening. Stationary panels in a large print framed the window on each side and a tailored cornice finished the window. Although there was nothing out of the ordinary about the room but how it was put together, the colors, patterns, and the effort to create comfort, restful feeling, and serenity what made me feel down at home, and I couldn’t help feeling impressed!!! Luxury and style for windows! I would like to share the Modern Novelties collection from the Kravet Couture fabrics. Total luxury and style for your windows. Notice the unique fabrics with metallic threads, intricate embroideries, open cutouts, and the delicate sheers. If you are looking for the extra ordinary, and the luxurious experience, we have it! call us (630) 420-0800. Mixing patterns to create beauty, elegance and style! Mix patterns that compliment one another, not fight each other. Two large patters will look odd together, instead mix smaller patterns with the large ones for harmony. Take a look below, and see how the stripes with the large botanical pattern make a perfect match for this Naperville home. When mixing patterns, one design element must tie the two together, such as colors, and forms. 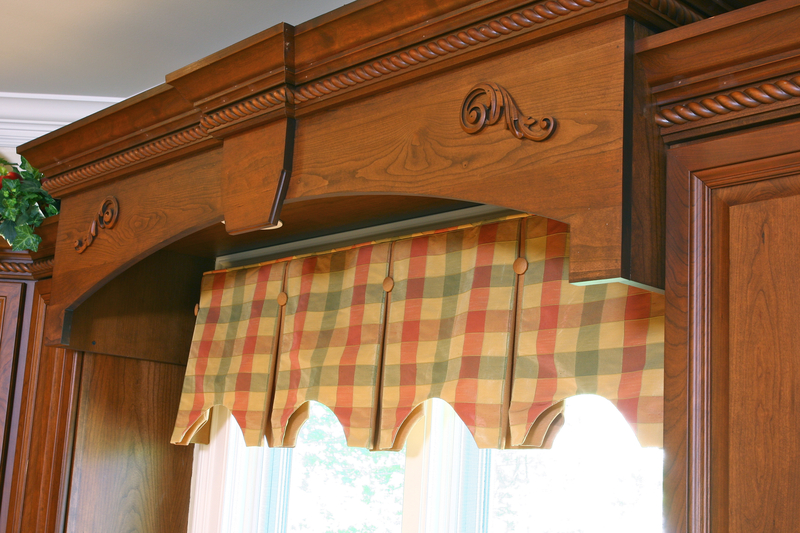 The valance in the picture below shows how the color of the fabric inserted into the pleats and buttons is a perfect color match with the checks used in body of the valance. At most mix three patterns, because adding too many might be overwhelming, and the draperies will loose their elegance. 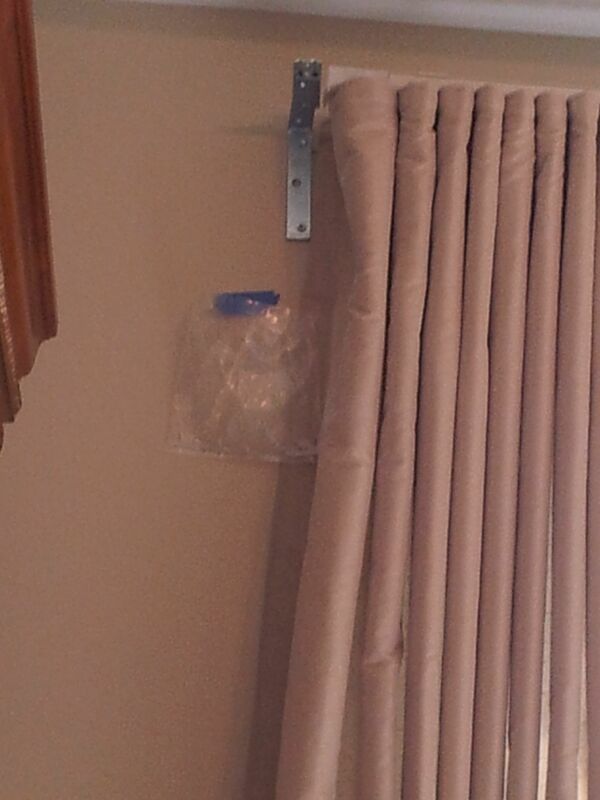 In the picture below a check fabric with the toil and one solid fabric, made the drapes for this breakfast nook outstanding. Customer care is an important service Gailani Designs provides for their clients. Their installers are instructed to leave the clients home clean. All debris are picked up and disposed of, the carpet is vacuumed if necessary, furniture is returned to its original place, and the room is all in order. We hire installers that are insured and certified. Please view the picture below, where the installer puts a plastic bag under his drill to collect all the debris and prevent it from spilling on the floor. Now that is customer care! Do you like this commercial drapery project? Commercial spaces can look stunning too! Unfortunately, windows in commercial areas, like offices, are neglected. The common use is adding blinds, solar screens, and old fashioned vertical blinds. 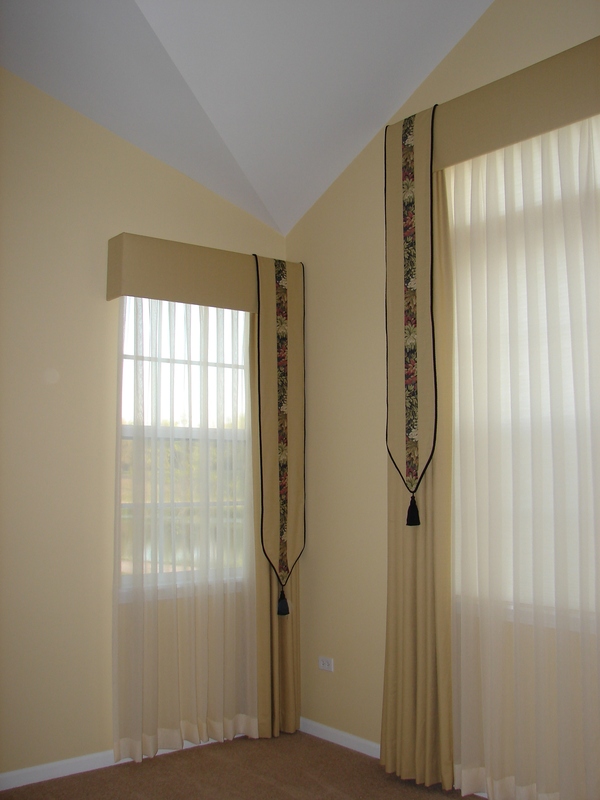 Draperies can add beauty and create a very special feel to any room, commercials or residential. Tie backs can make a huge statment! Every element in the drapery’s design is important and it can make a definite contribution to the over all look of the draperies. Take for example the tie back: a simple drapery panel can be turned into a magnificent one by adding a special tassel tie back or a decorative embellished one. Tie backs could be made from natural materials, such as raffia, dried flowers, tree barks, ceramic beads, and materials of similar nature for that special look that one might desire. Pleated fabrics, ruffled fabrics, trims, fringes, pleats, buttons, grommets, bows, and ribbons, to name few ideas can be added to the tie back to make them unique! Lets look at the slide show below of some designs from my portfolio to get few ideas!